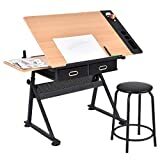 If you have a knack for drawing or if it is your profession then there is nothing better than a table for drawing to help you do your job. Drawing tables relieves you from the stress of managing large sheets and blueprints as these fit those large pieces of paper with ease. Thus, they reward you with an effortless working every single time. 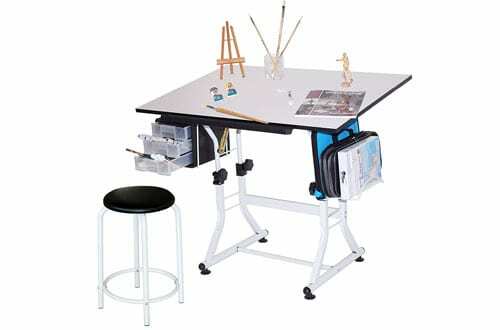 However, it is not easy to choose the best drawing tables in the market. Are you feeling perplexed on which model to choose? If yes, then the article below will surely be of great help. 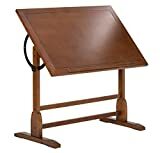 The content below features the best drawing tables, carefully narrowed down on the basis of their reliability, workability, and of course, their durability. Have a look at the article and then you would surely know which one to choose for your next project. This table from studio designs gets full marks on the basis of looks and comes with some impressive features as well. 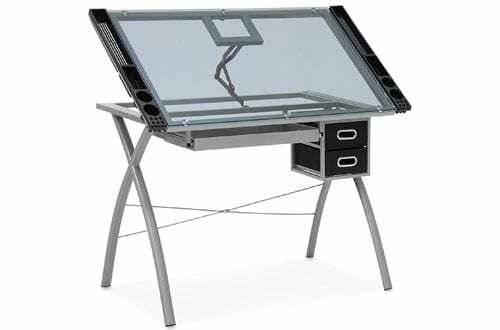 The primary 38*24 inches working surface is backed by a blue tempered glass for added safety. As this has a glass finish, it can also be used for light drawings as well. Moreover, you get a sturdy and stable construction for ease of usage. Comes with 3 plastic moulded slide drawers which can be used for storage purposes. The top can be tilted at a maximum angle of 35 degrees. Yet another model of a table from Studio Designs, this is a table that looks and functions in an outstanding manner to reward you with great convenience while using it. 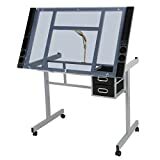 To make drawing and working easier, you get a 24” pencil ledge while the whole top has a laminated finish which looks really classy. Furthermore, the included stool makes it even easier for you and the heavy gauge steel construction adds greater durability to the table. Comes with an under desk storage shelf. The top can be adjusted up to an angle of degrees. 6-floor levellers offer great stability. 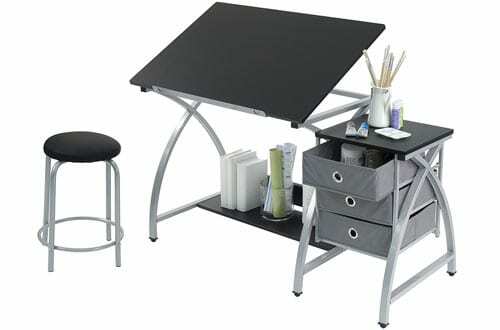 If you want the best flexibility with no challenges regarding your working position, this table from Zeny is a smart choice to make. 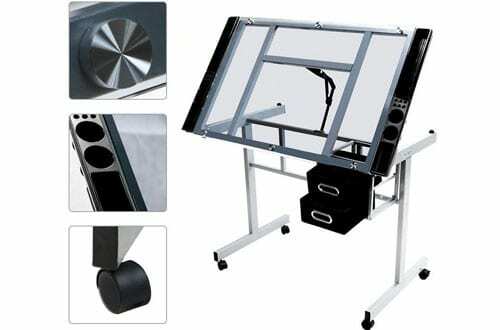 The drafting table comes with an adjustment mechanism that makes it very convenient to draw irrespective of your working position. 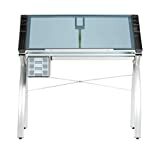 Also, you get a highly reliable heavy gauge steel construction combined with a tempered glass top for safety and durability at par excellence. The single shelf underneath the table top along with two sliding drawers provides you with enough space for storing equipment. Comes with 4 smooth casters with 2 lockable casters. Having an impressive arch design to make it easy to work, this MDF table from Zeny is smart and intuitive to make the everyday working experience much better. The work surface easily tilts to a good 48 degrees for better convenience whereas the MDF, PVC and steel construction ensures top-notch durability as well as stability. 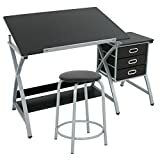 The desk also offers a great 130 pounds of weight carrying capacity and the added stool has cushioned support with 150 pounds of weight capacity. Comes with 3 spacious woven fabric drawers that give more storage options. Has a lower shelf underneath the table. The Eclipse model of the table from Studio Design comes with features meant to deliver supreme performance while you will be busy nurturing your creative mind. It features an exceptional 35.5” x 23.5″ working surface for all your sheets to fit with ease. Also, you get the benefit of getting a padded stool for added comfort along with a 6-floor leveller for top-notch stability. The storage shelf underneath the table top assures an ample storage space for your needed tools. 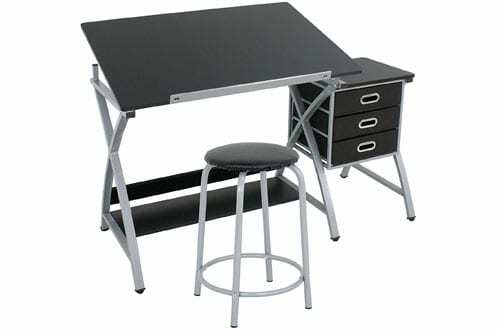 Heavy-duty steel construction ensures great durability. wder coated construction for added durability and resistance against corrosion. Furthermore, there are 2 pull out storage pockets made of non-woven fabric along with a side pigment shelf for extra storage. 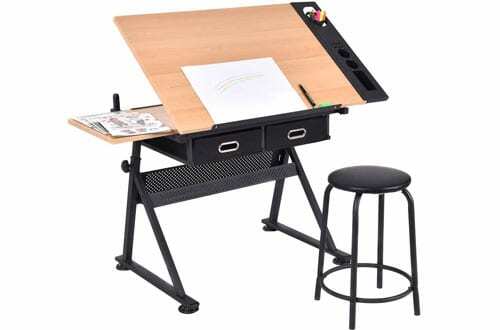 Use it for painting, drafting, or just normally as a desk anytime. Foldable and adjustable design along with ease of installation. ABS material non-slip base to give great stability and also prevent the floor from scratches. When it comes to timeless looks and fashion, the vintage table from Studio design is undoubtedly one of the most appealing tables along with impressive features available. It provides you with the amazing flexibility of use. Use it flat or angled at 90 degrees, you will always get an extraordinary experience. The antique design and finish complement any home decor with sheer class while the solid hardwood construction ensures top-notch stability. 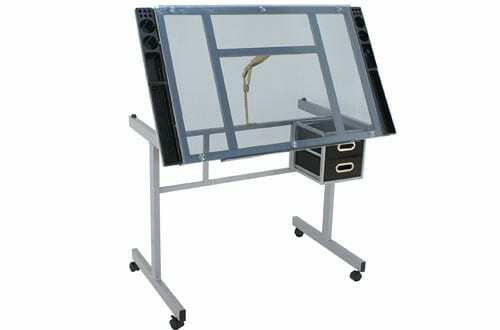 The 42″ of the work surface can fit all types of drawing materials without any challenges. Comes with built-in pencil groove. 24” pencil ledge for added convenience. 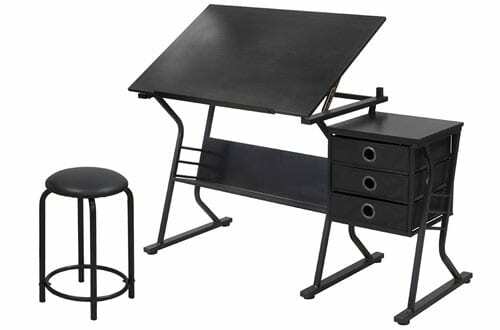 One of the most modern looking drawing tables in the market, the Martin Ashley model complements great looks with some amazing features. 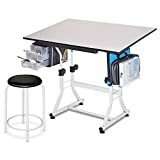 It features a melamine surface that makes drawing and drafting much easier on the table top and also comes with an equally good looking stool which is vinyl padded. Moreover, the table also features a design that enables you to adjust the height as per your need. Pencil trough for added benefits. 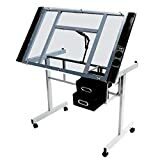 You might feel the need of doing different types of work on your table and to make each of those easier, Best Choice Products have come up with this innovatively designed drafting table that can be angled from being flat to an angle as per your requirement. The centre drawer beneath the table can also be drawn out to store important blueprints and papers. Furthermore, you get a really modern design that will look amazing in all types of decor. Constructed out of durable powder coated steel for added durability. Cross Brace structure ensures stability. Comes with two side drawers and 4 removable side trays for greater storage solutions. 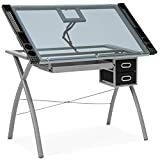 At the topmost spot, you get an amazingly designed and smartly crafted drafting table from the reliable makers, Yaheetech. One of the most impressive features of this table is its ability to adjust the height anywhere between 80 cm to 125 cm. The iron tube construction ensures great durability so that it can keep serving you for years to come. Comes with 2 easy glide drawers for organized storage. 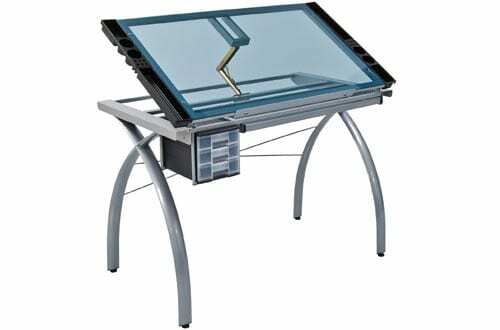 Glass table top can be rotated to 45 degrees for greater convenience. Non-woven drawer and plastic tray. 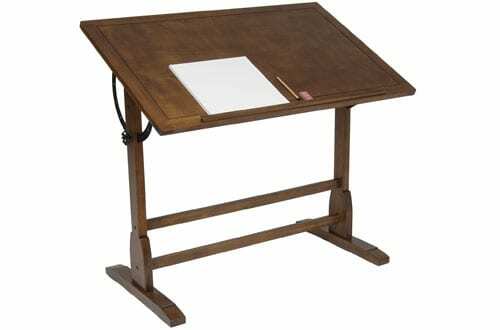 Explore your creative side and practice your art perfectly by using a sturdy drawing table. So, without thinking twice, start polishing your skills.